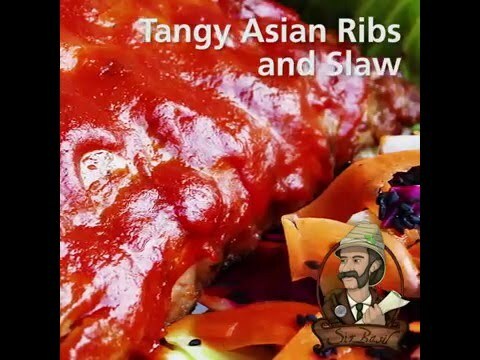 TSTE® Korean Grill Rub and a hint of peanut butter add a unique twist to mouthwatering ribs while TSTE® Hickory Smoked Sea Salt and TSTE® Ginger Teriyaki Spice Blend infuse coleslaw with a zing of summer BBQ flavor! TRIM silver skin and excess fat from ribs. Rub with 3 TBS TSTE® Korean BBQ Rub. Let sit 20 mins. Heat grill to approx 375°F. Grill, covered, over indirect heat for 30 mins flipping once to brown all parts. PLACE ribs on aluminum foil and pour on apple juice. Seal tightly. Grill over indirect heat for 30 mins. WHISK 2 TBS TSTE® Korean BBQ Rub, 3 TBS rice vinegar, 5 TBS peanut butter, ¾ tsp TSTE® Hickory Smoked Sea Salt and TSTE® Honey - Granulated in saucepan. Simmer 30 seconds. REMOVE ribs from foil. Baste with glaze. Place on indirect heat. Cover and grill 5 mins. Flip and baste. Repeat for 30 mins. WHISK together ½ tsp TSTE® Hickory Smoked Sea Salt, 4 TBS rice vinegar, 2 TBS peanut butter, TSTE® Organic Extra Virgin Olive Oil, TSTE® Wasabi Powder, and TSTE® Ginger Teriyaki Spice Blend until smooth. TOSS in vegetables. Sprinkle with TSTE® Sesame Black Seeds.